Last week, our company’s Nokia 2730 Classics arrived as part of a contract with Telstra Clear, of whom we’ve been a customer since the 1980s. They are a reminder of how technology is regressing. Remember that scene in Life on Mars, where Sam Tyler, or Samuel Santos in La chica de ayer, tells Annie Cartwright, Annie Norris or Ana Valverde (depending on which version you saw) how LPs had been replaced by MP3s and digital music, and that the sound is ‘much, much worse’? That’s sort of how I feel with these new gadgets. Left Not quite the same as ours—the display is different—but this is a publicity shot of the Nokia 2730 Classic. 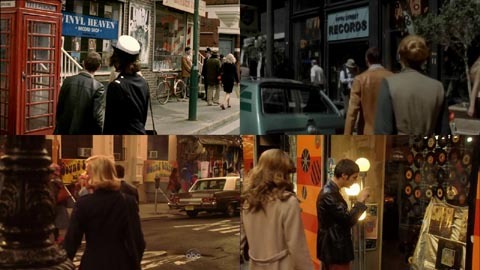 Below Life on Mars’s record shop scene in its various incarnations (from left to right, top to bottom): the UK original in Manchester; the unaired US pilot, set in Los Angeles; the US remake, set in New York; and the Spanish remake, set in Madrid. On the surface, the new phones aren’t much to look at. Compared with the 6275i phones that the 2730s are replacing, it’s clear that they are built to a price, cost-cutting for easy manufacture in China rather than Korea. There’s not much of an excuse here for design simpliﬁcation: this is manufacturing simpliﬁcation. I have reason to be cynical. I’m sure it’s part of a conspiracy to force us to get a nicer model. I remember buying a Microtek scanner for around $600 in the 1990s—probably around 1996—and it lasted me for years, till around 2002 when I ordered an upgrade. I looked at the specs for the latest scanners and thought, ‘Wow, here’s one with a higher resolution going for half the price.’ I brought it back and the scanning quality was total crap. I wrote to the distributor in Auckland and they informed me: the equivalent model to my old one is this other machine costing $600. The difference is that the half-price one has a plastic lens and my old one had a glass lens. So if I wanted one with comparable quality, I would need to pay twice as much for one with a glass lens. In other words, it would still cost me $600. I bought the glass one and they were as good as their word, although I had to put up with a smaller scanning area (but I got a faster speed). The resolution ﬁgure, it turned out, was meaningless, because the actual quality of the product was so poor. Technology didn’t really advance in six years. I still had to pay the same price for a machine with actually less capability on the primary function, which was scanning an area of x cm². This seems like a repeat. I have yet to try what it’s like as a phone, because the switchover’s not till the 8th, but for many features, it’s poorer. It has a better media player. The speaker for playing music and movies is better. The graphics move more nicely. Nokia supplies some free maps (which, incidentally, get deleted when you eject the memory card, though you can re-download them for free from its website). But (and there must be a but given the headline): the camera is worse (judge for yourself below) and the battery life is shorter. I might not be an initié when it comes to cellphones, but I know that people have been using them for telephony and photography for a lot longer than as MP3 and 3GP players. On at least two of the three major criteria on which a cellphone can be judged, the 2730 is worse than the mid-decade 6275i. Judge for yourself below. These are photographs (reduced) taken at Massey University’s Blow festival exhibition, currently on at its Wellington campus. And what is the point of that? Unless Nokia now tells me: if you want the quality of the old one, it’s this other model, which will cost you an extra $300. I know there are many exceptions to what I’ve just written. The Asus laptop I type this on is way fancier than one that cost twice as much with a fraction of the power in the mid-2000s. But just because one area of technology marches so rapidly doesn’t mean every area follows suit. I’ve experienced the opposite, in some ways. My first iPod was 40gb, $800, ran for 2.5 years and the battery lasted around 4 hours. The second doubled the capacity, halved the price, is now 3 years old and still going strong, and the battery lasts at least 8 hours. I’m not an Apple guy, but sometimes, technology does get better. Do what I did and switch to 2degrees. My mobile costs me half what it used to. Good point, Dan. I wonder if they hold anything back, e.g. by default, the Apple Ipad cannot hyphenate (something to stick into v. 2, methinks). But the Ipod would deﬁnitely be a gadget that has improved with each iteration. Stuck with Telstra as I have signed a two-year contract. What is Two Degrees charging?